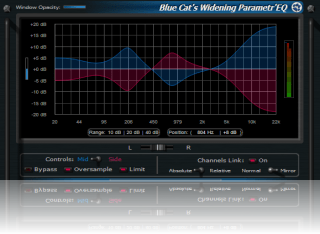 "A powerful multi-band processor for stereo widening and narrowing"
For more information about the Parametr'EQ technology, please read Blue Cat's Parametr'EQ plugin's description. Additional information about stereo widening with mid/side processing can be found in our M/S processing paper. 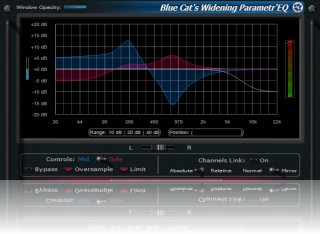 True WYSIWYG 7 bands parametric equalizer with independent mid/side channels. The equalizer can be placed with great precision in the stereo field thanks to the 'center' parameter. Separate center/sides equalizing for a precise customized multi band stereo widening/narrowing effects. 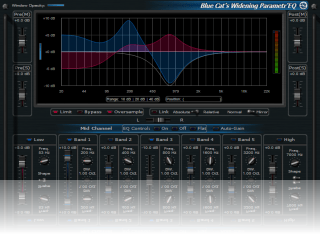 Non linear modeling: add some warmth or analog distortion to each EQ stage. 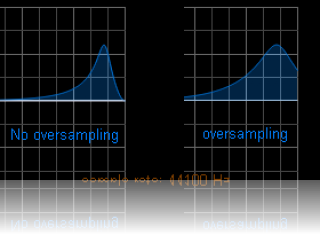 Oversampling for optimal sound quality, whatever your sampling rate. The effect is bypassed for 4 seconds every 40 seconds. Misc user interface performance enhancements. Installer now registers the VST plugin to avoid registration issues in some host applications. Frequency ranges have been enlarged. Skins update: some sliders did not have the color of the corresponding channel. Bug fix (VST): in some hosts, when a loading a project the parameters where not properly restored and the response curve was flat. Bug fix (skinning): knobs did not display the disabled state image. Non-linear behavior with analog compression and distortion at each EQ stage. Output brickwall limiter for output protection or compression effect. Oversampling capability for optimal sound quality, even with low sampling rates. New low cut and high cut filters. 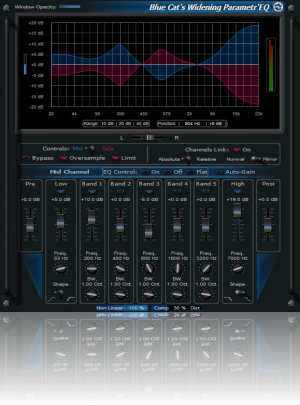 Smooth bypass: activate each band of the EQ with absolutely no noise. Streamlined user interface with simplified controls for optimal workflow. Zooming: adjust the dB range of the EQ and the response curve graph. Frequency response measurement: new mouse coordinates display. Reduced memory consumption when several instances are loaded. Note: due to the number of changes in this new version, it is installed as a new plug-in. If you have a previous version installed and do not want to keep it, just uninstall it manually. 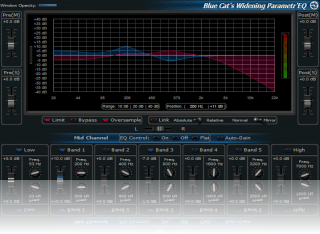 Brand new skinnable graphic user interface using Blue Cat's skinning language v1.2.3. Performance and precision improvement of the filters algorithms. Brand new GUI based on customer feedback.